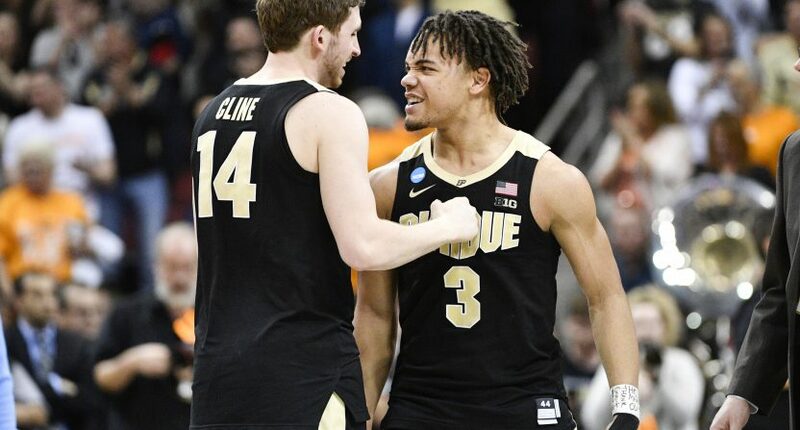 The Purdue Boilermakers are off to the Elite Eight for the first time since 2000. After blowing a lead that was as high as 18 with 16 minutes to go, No. 3-seed Purdue was able to take down No. 2-seed Tennessee 99-94 in overtime on Thursday night. Carsen Edwards (29 points) and Ryan Cline (27 points) combined for 56 points to lead the way for Purdue. Cline was particularly spectacular, making 10-of-13 shots from the field and 7-of-10 three-pointers. Some of the three-pointers were high-difficulty shots, like this stepback triple to tie the game with 36.4 seconds left in regulation. This was a very entertaining game between two very good teams. Well, it wast at least very entertaining unless you’re a free-throw aficionado. Purdue won the game despite going 16-of-33 (48.5%) from the charity stripe, while Tennessee was barely better with 14-of-28 (50%) free throws made. That’s a combined 30-of-61 (49.1%) from the free-throw line from two top-10 college basketball teams. What makes it even crazier: their three-point shooting was as good as the free-throw shooting! Purdue was 15-of-31 (48.4%) on three-pointers, and Tennessee was 12-of-24 (50%). It has to be driving Tennessee crazy to think that, if they could’ve just made over half of their free throws, they would’ve come away with an Sweet 16 victory in regulation. For Purdue, they don’t really care about how ugly the free-throw shooting is or how they got the victory. The bottom line is they’re going to the Elite Eight, and they’ll be a very difficult team to beat there for Virginia or Oregon. Especially if the Boilermakers can actually make at least half of their free throws.